Yesterday we went to see a perfectly wonderful movie! It’s a bit of a rare day when we actually go to to a theater and watch a movie – for a couple of reasons. First, let’s be perfectly honest here — there aren’t many movies out there that have much in the way of substance these days. Okay, maybe I am showing my age here, but I no longer enjoy watching twenty-somethings bouncing around on the screen in a silly romantic comedy. I’m also not into animated movies which may indeed be my loss, as “everyone” seems to love them. Secondly, we don’t have a “modern” movie theater here in our little neck of the woods. Yes, we have theaters, but not the stadium seating and surround sound systems that we grew to love while living in Palm Desert California all those years ago. Rumor has it that the powers that be are planning on building a “modern” theater here sometime this year. That will be marvelous. In the mean time, we normally travel either north (to Canada) or south (to Everett) to see movies. This time we went south and saw the critically acclaimed movie, The King’s Speech. AWESOME movie. At least WE thought it was. Apparently some of the big wig movie critics agree as it is nominated for 6 Golden Globe awards, including Best Picture. If you are an Anglophile or a history buff (raising my hand here) then you couldn’t help but enjoy this one. It’s set in the late 1930’s in England and tells us all about how the King worked through a speech impediment in the day of radio (“wireless”) – when this was THE way to get your words out to the people. 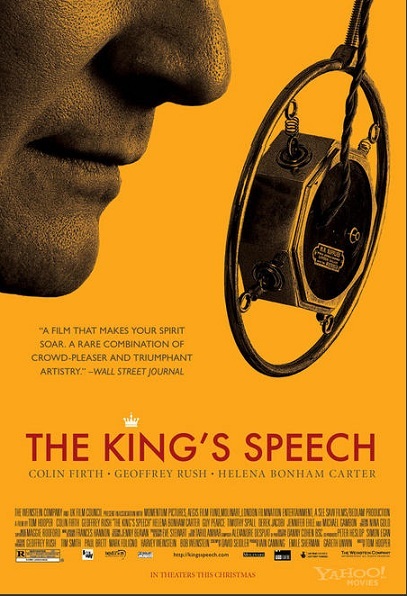 Tremendously acted by Colin Firth as the King and Geoffrey Rush as his speech coach. Last summer I read a HUGE book on “The Queen Mum” where the King’s stuttering was definitely addressed several times. You can read my review by clicking on “Books 2010” and scrolling down to September 11. Another reason I may have thoroughly enjoyed this movie was because it is a “period piece” and I love how good movies can recreate the dress and surroundings of days gone by. This movie did a great job at that – the costumes were impeccable, as were the sets. It was also uncanny the way the actors were made to quite resemble the real-life characters. This movie is going to win something. I’m no critic, but that’s my prediction! While at the matinee movie, we noticed that our fellow movie-goers were mostly …. “older”. Okay, fine… we “older” folks may have a bit more time to attend daytime movies. What was unnerving was the “older” lady sitting next to us. She had a LARGE tub of popcorn – you know, those round cardboard tubs – and was noisily fondling her kernels throughout the showing! Not only did she grab handfuls and place them in the proper orifice, she continuously sifted through the corn- even while chewing- scraping her nails over and over on the sides and bottom of the tub. This was a quiet movie, and honestly we never would have noticed these annoying sounds if there was a lot of background music or explosions or maybe car chases going on…. but GOOD GRIEF!!!! It was all I could do to not reach over and hold her hand – if just to confine the clawing and sifting for a short time. Luckily, the movie was so good I was able to tune out the scratching at times… and chew in tandem with her as I meted out my own little bag of the fluffy stuff – sans butter, of course! This entry was posted in General Musings and tagged movies, popcorn, The King, The King's Speech. Bookmark the permalink. 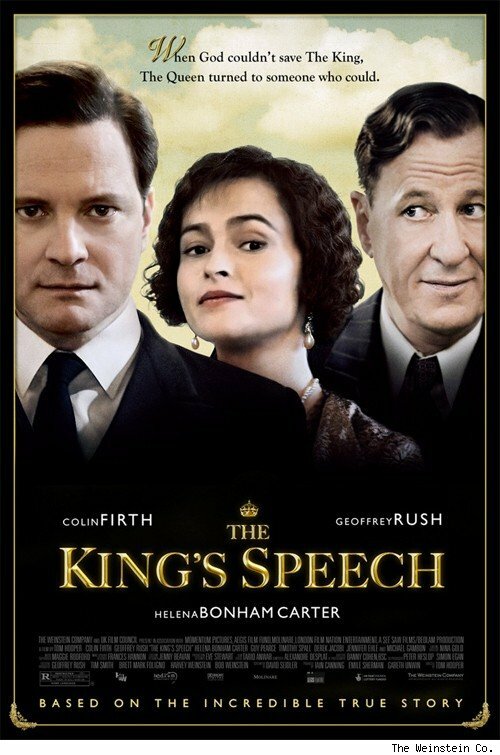 A well crafted piece of entertainment built around a couple of flashy but engaging performances from Firth and Geoffrey Rush. Good review, check out mine when you can!